Sculptural painting is an interesting Russian Art form. It is an artistic direction that combines the elements of sculpture in the part of the working material - decorative plaster, and the elements of painting in the part of the technique of the palette knife, implying the creation of three-dimensional textures and elements surface by the principle of "one smear - one element". This technique is also sometimes called "volumetric" painting. The names are different, but the essence of the technique is one - creating voluminous colors from volumetric plaster with the help of a palette knife. The technicality lies in preparing the paste/plaster, which in itself is an ART. 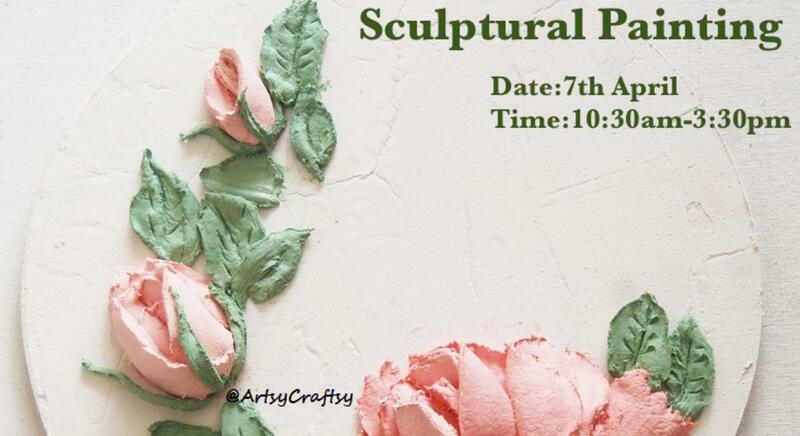 In this workshop we will teach you how to make your own paste, how to create a background, learn various strokes to form different petals and leaves to give that 3D effect. This workshop is for only those people who are serious in learning this new ART form and have the patience to take it forward. Evgenia Ermilova is the Master at Sculpture Painting. She is the creator of the technique called sculptural painting and she creates exclusive watches, panels, mirrors and other interior items. The pastes/plasters used in this form of art are sold by her name. Kanchan Yadav is the Founder of Artsy Craftsy and has learnt this art form from non other than Evgenia Ermilova. She is a successful artist and trainer.